I loved the judge's paneling, but I knew I wanted to go with a lighter, softer color, and that I wanted to do something a little crazy on the walls. After moving from house to house every 1-3 years for my entire life (my dad was military and you can read about our recent house-jumping here) I'm ready to put down roots and make a house my own. But at several hundred dollars for the rolls I would need to paper the Dining Room, I knew I had to pass it up. So I decided to paint an enlarged version of the Silvergate pattern on my walls. I started sketching and filling in with paint, and before long I had this: And after what seemed like an eternity of sketching, erasing, and painting, I finished! There are tons of imperfections in the pattern, but I'm holding my inner perfectionist at bay and trying really hard to ignore them. There's no guarantee that I won't constantly be touching up and "fixing" things, though. But for right now I'm happy with it. And the total cost for the "mural" comes to $30! I bought 2 cans of Behr Interior Flat Enamel for $15 each on sale, but I barely put a dent in either can, so I will be able to paint other rooms with both colors! 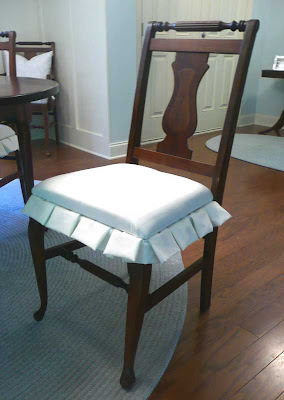 I bought this set of chairs at a yard sale a few years ago for $90 and recently gave them a facelift by recovering them and giving them a little pleated ruffle (check out the how-to here). I spent $8 on fabric and was given the foam for free, so the total I spent on these chairs comes to $98. The braided chenille rug came from JC Penney Outlet a year ago for $30! 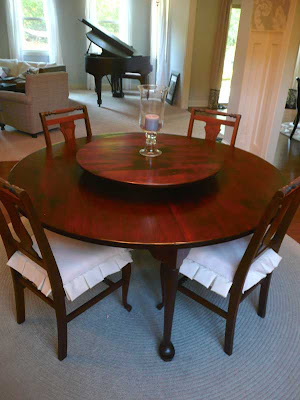 The table came from an auction in Missouri about 5 years ago and was a whopping $25! Keith and I refinished it and now it's one of our favorite pieces of furniture. Don't you love the lazy susan? My mom very graciously helped me sew the drapes. The fabric was on sale at JoAnn's for $2/yard and I think total we used 9 yards. We lined them with queen bed sheets that we found at Anna's Linens for $6 each. I love how full and heavy they feel. Total cost = $30. The shutters came from a yard sale a few years ago. My mom found several for $8 each, but when she got them home not a single one fit any window in her house. She held onto them, though, and magically, every one of them fits a window in our new house! They also happen to match the trim color perfectly. The curtain hardware is from Ikea and cost around $15 for everything, including the glass finials. This buffet came from a yard sale in Illinois a few years ago and was $100. That's a bit of a splurge for me, but this piece has been worth every cent. The convex mirror came from JC Penney outlet a few years ago and cost $30. I had searched everywhere for one of these, but was always disappointed with the $100+ price tag, so $30 seemed like a good deal. I just purchased the lamp with birthday money off craigslist for $20, and those cute white ceramic apples were $6 at a recent yard sale. The crystal candlesticks were a gift from my parents. Grand Total for our "wallpapered" Dining Room = $392! I will try to post some pointers later for anyone who is interested in doing a wall mural so you all can learn from my mistakes! This is gorgeous!!! I'm so glad you tackled this "wallpaper" pattern with paint! I've always thought you could do anything with paint to get the look of wallpaper without having the annoyance of having to put it up:) And you did it! Yay!!!!! Can't believe how little you spent on the entire room, you should def. be proud. I love the color palette and different use of materials and textures. Its so elegant and soothing at the same time! Hi and what a beautiful dining room you've created. Your self painted wall mural is gorgeous! You did an outstanding job. Now those draperies are so beautiful and I can't believe the fabric was $2 a yard! I can never find something this great. Wow! This room looks fantastic! Love the mural. What colors did you use?? Looks so good! I can't believe how little you spent while achieving a luxiourious look. fantastic stuff! I love how you pulled everything together. I look forward to reading a tutorial or some tips on your wall treatment. It's gorgeous! I LOVE the painted wallpaper. You're so talented! It's so amazing. And those drapes! Stunning! It's hard to believe the budget on this room. It definitely looks expensive. Great job! Please please give us those pointers on how you did this! It is just so wonderful and so unique! This is going in the idea file for sure! Just beautiful! It all looks like a lot more than $398! :) What wonderful finds and a great job pulling it all together. ABSOLUTELY FABULOUS!!! The space is beautiful and you are so patient! Remember that imperfection is perfection because it has you in IT! Stop by...love to meet you! Wow! Those walls are amazing! You should start your own makeover show! This room is amazing, your painted wallpaper is stunning. Those walls are so beautiful! I would have easily believed that you spent ten times as much on that room (and that would have been a great deal!). I'll say it again. Stunning! And I really like the drapes. Way to score the fabric for $2! The length is just perfect, I love how they puddle a bit but not too much. If you get a chance would you mind telling how much longer they are than floor length (does that make sense?)? Thanks! Oh. my. goodness. Holy cow, that is amazing! The colors, the pattern, wow, just gorgeous. I'm gonna quit now, 'cuz I can't think of any more fabulous adjectives! Thanks so much for your comment on my blog and for sending me your link to enter my $200 makeover challenge. Your room is awesome!! Send me any further description of your redesign process and I will feature your makeover on my blog for sure. Thanks for reading!! I checked your blog out a couple weeks ago and totally went to work talking about your "lamp to chandelier" project. They loved it! 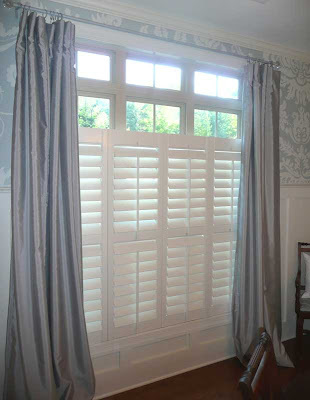 I also wrote down your site for someone to make roman shades out of mini-blinds. You have such great ideas! Keep up the good work. Love it! It was pretty before but now it looks fresh and updated. I love that paneling! Girl, you did a fabulous job! You got great deals everything, especially that lamp and mirror. Britt, I absolutely love this room. I can't believe you painted the wallpaper. That is just amazing. You did a wonderful job!! Gorgeous, gorgeous, gorgeous! And here I was thinking you were laboriously using a big stencil but you were sketching and hand painting...OH MY! That is so impressive! The other elements of the room are beautiful as well, from the curtains to that great table with the lazy susan. You did a great job redoing this room on a budget...I can't believe how little you spent! Such beautiful work Britt! Congratulations on a job wonderfully done. This is stunning! I am eager to hear your tips and how to. Perhaps I will attempt a mural of my own. Thanks for the inspiration. Awesome wall mural! Your husband is fortunate to have such a talented and thrifty wife! Great deals! The wall design is amazing! I want it in my bedroom! This room turned out absolutely beautiful! Great Job! What an amazing design, your truly are an artist. I am totally amazed at your talent. You painted all that by hand?! Wow, you rock!!! Fantastic! How incredible it all looks, painted by hand! That JCPenny convex mirror is a true steal. I've been on the prowl for one forever and wow, $30 is a great deal. The last one I saw in a boutique was over $300! I am absolutely in awe of what you have created. What a lovely room. I would never have believed it's price tag if you hadn't posted it. Great job! Have you blogged at all about your Ireland/Scotland trip? I'd love to find out where you've been! Wow... sure looks like wallpaper to me! Great job on the whole room. 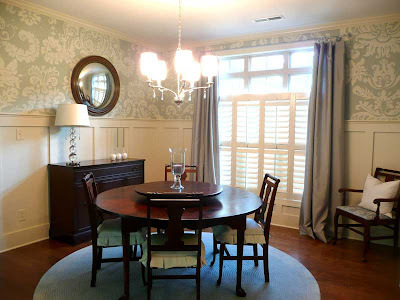 Love the curtains as well and round table. You ALWAYS amaze me! I LOVEEEEAAAHHHHHH this! This is amazing!!! It looks perfect to me!! Your dining room is just gorgeous, Britt. 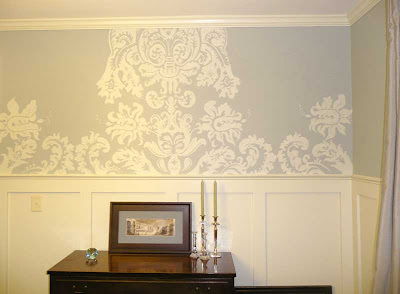 I've always wanted to do a damask wall paint and it's such an inspiration to see someone go through the process! and have it turn out so beautifully. I was very taken seeing the dining room table, too. Love that Lazy Susan. The finish and coloring is so beautiful. You are such a talented lady, Britt : ) and a natural born shopper at that! Wow! I love yours with the enlarged pattern better than the actual wallpaper! I painted a letter mural on two of my office walls, so I know how much work it was to paint that pattern in your dining room. It was probably even harder, because I was able to tape off the straight letters -- your design is all curves. Whew!! LOTS of work & time & patience required!! That is seriously impressive. And so is the tiny amount you spent on making over your dining room!! Great job! Looks fantastic, love the colors you chose, too. You did this by hand??? OMG!!! This is beautiful!! What a fantastic job you made of the walls, I am amazed at your talent & perseverance. The finished room looks delightful. (messed up the first post somehow!)Sorry. Wow! That is stunning! I'm so stuck on choosing a color for my wall and picking fabric for the curtains in my dining room. I had a fabric chosen and it sold out. I LOVE this and wish I had the patience to pull it off in my home. Absolutely beautiful! Thanks for the inspiration. "wallpaper"? I am looking for something very similiar for a room in my house that also has a lot of white paneling and trim. Never mind; Ijust saw your later post where you listed the colors. :-) Great work again! Absolutely stunning! I'm so proud that you stuck it out and finished it. I know I would have gotten about half way and said forget it. These walls are beautiful! This is an AMAZING job. Good for you! You should be so proud of yourself--and really proud of your beautiful dining room! Wow, wow, wow!!!! Fabulous room!!! I love the walls, the colors, everything!!! I can't believe you hand painted all that...wow. I just did a similar pattern on a large canvas with a dark pink rose background for my grand daughter's room. It took me so much time. I love your transformation, it turned out so lovely! Oh my goodness I am in serious LOVE! How on earth did you have the patience to do that (how did you do it period?) Looks amazing! p.s. Is the color smoke a grayish blue like it looks? I can't believe how beautifully it turned out. I'm SUPER impressed. Your daring and eye for design definitely paid off!! This is such an incredible transformation. I am practically speechless. You actually sketched that yourself? You have some extreme talent. I could never do a pattern that detailed that well. Thanks for such amazing inspiration! Thanks so much everyone! Ya'll are too sweet! 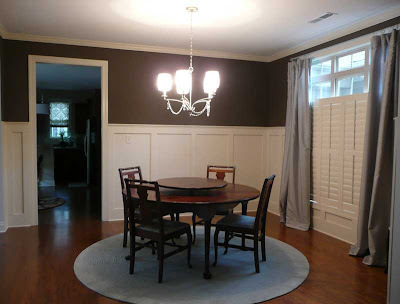 John & Jennifer - yup, it's a smokey grayish blue color - Granite Dust by Glidden. I liked it so much I'm using it in my living room and foyer, too! Very inspiring! love your walls! absolutely gorgeous...i must finish my own dining room! This is super duper! Very inspirational! this is so SO beautiful! i am amazed. i actually like your painting better than the wallpaper. the larger scale looks much more modern and unique. the whole room is put together and gorgeous. well done! oh, and I LOVE your baby grand! I'm so jealous! 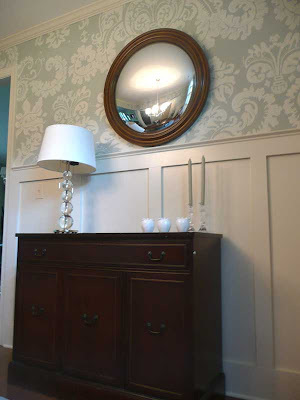 I love the choices for your dining room - and the hand-painted wallpaper especially! It just might inspire me to do the same on an accent wall in our bedroom. Great job! This is AMAZING! Simply beautiful! I love the little "skirts" on the chairs as well, great job! I'll be follwoing you! Did you use a stencil? I love it! More details on how you did it please! what a gorgeous room!! i'm inspired by you.......i was thinking of doing wallpaper but wow..what you did instead looks amazing! This is fantastic!!!! I really love the wallpaper. So beautiful and inviting.